In this review we explain why you should not buy the ProSignalRobot for binary options trading. 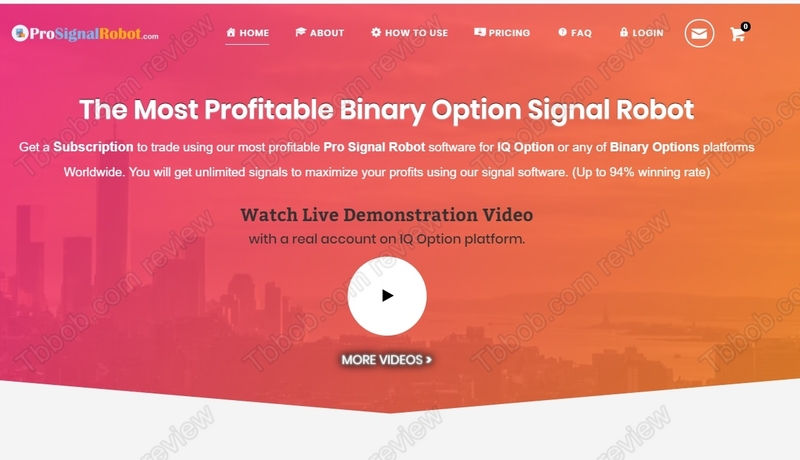 The proposition of Pro Signal Robot is very simple, it is a software that will generate trading signals for binary options trading, currently eight Forex trading pairs are supported. The robot will allegedly win 80 – 94% trades, which means that you would become rich very quickly. You can get the robot for $199 per month or $499 for a lifetime licence. We’ve been trading binary options for six years and we can tell you one thing for sure, an 80 – 94% winning rate is impossible in the long term. Such a high success rate is wishful thinking and based on just these numbers we believe that Pro Signal Robot is a scam. Also, consider this: with an 80 – 94% win ratio you would become a millionaire within a few months even with a very low initial deposit. If the robot is this successful, why it is being sold for only $499?! It doesn’t make any sense. Another big problem is that Pro Signal Robot is very risky. They won’t let you try it in a demo mode and all sales are final, no refunds. This means that if you find out that the robot is not working after you bought it, it will be too late, your money will be lost. Should ProSingalRobot be really that powerful, they would be offering a refund guarantee. Because if the robot makes you money, you won’t ask for a refund, right? Since there is no demo and no refunds, it is another hint that Pro Signal Robot is not profitable. And forget about their video with profitable trades, they are easy to do. No matter how you trade binary options, you will always have some winners. Then you put just the winners into your video and voila! In trading you will always have winning and losing trades, the key to success is to have in total more profits than losses. Last but not least, a software that will generate trading signals for investment instruments such as binary options is considered to be an investment advice service. You need a licence from a regulator to be able to offer this kind of service legally. But Pro Signal Robot is not regulated, therefore it is illegal in most countries. We are pretty sure that ProSignalRobot cannot deliver what it promises, and since there is no demo and no refunds, we recommend staying away from it. When you have a trading system or idea, first you should always check them on a demo account to see if they work. Only when your tests have good results you can start trading with real money.